Via Birdchick, I first learned that a gynandromorphic Northern Cardinal (Cardinalis cardinalis) had been spotted by a retired school biology teacher in Rock Island, Illinois in 2009. Minnesota Birdnerd has posted additional photos of this sighting. It was then that I decided to start up a collage of songbird gynandromorphs . . . and very shortly after that, when I realized that I was rather too busy for the undertaking. Fortunately, I was reminded of the project by recent news (and controversy) of a similar backyard sighting at the beginning of this year reported by another academic, Prof. Larry P. Ammann, who when not teaching statistics at UT Dallas, takes time to appreciate a genetic anomaly. Before that, a curator at the Illinois State Museum, published his accounts (with photos!)H.D. Bohlen, 2006 of a bilateral gynandromorphic Northern Cardinal exhibiting male phenotype on the right side and female coloration on the left. This is actually the more common arrangementKumerloeve, 1954 than the inverse which has been reported in the most recent gynandromorphic Northern Cardinal sightings.1,2 Typically, female birds retain (post-embryologically) only the left ovary. In these cases of cardinal mis-direction, one might expect to find a testis on the left side, but as observed in other species (see below), the left seems to be reserved for ovaries only no matter what colors are on the outside. The first image of a gynandromorph that I came to recognize was that of the Zebra Finch (Taeniopygia guttata). “He” was discovered in the flock of Professor Fernando Nottebohm and was gifted to Agate et al., who began their study circa 2000. When housed with a female, “he” courted her with song, and she engaged in copulation and incubated several clutches of infertile eggs with him. When housed with males, they chased and attacked “him.” The testis on his right side was found to be “dysmorphic” although sperm production was evident. On the left side, there was an ovary but apparently without an oviduct. Researchers found that neural song network even on the left side of “his” brain was more masculine than that of a typical female, and the right side was substantially more masculine than the left. This gynandromorphic Zebra Finch presented evidence that sexual differentiation of the neural song circuitry is not only rooted in gonadal hormones but also endogenously in the brain cells. Later researchZhao et al., 2010 in gynandromorphic chickens suggested that somatic cells in birds are inheritently gendered (see also the review at Not Exactly Rocket Science). Photos of a likely gynandromorphic Black Breasted Black Faced Zebra Finch were posted to a Cebuano finch forum at the beginning of this year. Gynandromorphy in color mutations of captive Gouldians have been photographed as well.1,2 By the way, “half-sider” is a term typically used among aviculturists who participate in color breeding. As far as I understand, this is not necessarily gynandromophy, as it could be a case of bilateral somatic mosaicism in which genotype might be different, but allosomes on either side of the bird are (generally) common so that the specimen is uniformly male (ZZ) or female (ZW). There was a taleJ.C. 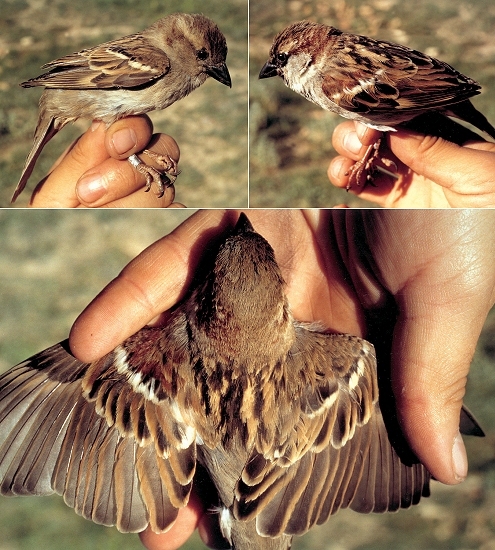 Abella, 2002 of two probably gynandromorphic House Sparrows (Passer domesticus) in two cities in Catalonia, Spain encountered during banding surveys in the late 90s. These again, exemplify the relatively more rare case of male markings on the left and female phenotype on the right. A gynandromorphic Black-throated Blue Warbler (Dendroica caerulescens) was spotted (and photographed) by banders in Spring 2007 at Braddock Bay Bird Observatory in Rochester, New York. A bilaterally gynandromorphic Black-throated Blue Warbler had been reported previouslyPatten, 1993 in Death Valley National Park in Inyo County, California. There was a report (albeit without photos) of one at Sunset Beach in Virginia in 2004 and another (with quite a nice Flickr set) of one encountered in Blue Mountains, Jamaica in 2010. 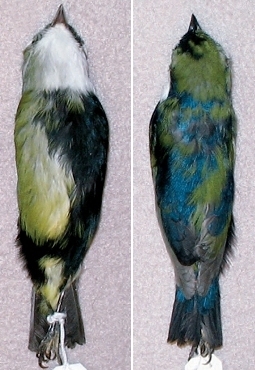 Gynandromorphs of this species exhibit noticeable overflow of somewhat diffused male plumage beyond the bilateral line onto what appears to be the female side. At Powdermill Avian Researcher Center in Rector, Pennsylvania, an Eastern Towhee (Pipilo erythrophthalmus) exhibiting bilateral gynandromorphy in plumage, size, and even molt progress was photographed and measured in 2001. In 2005, also at the Powdermill bird banding station, a Rose-breasted Grosbeak (Pheucticus ludovicianus) exhibiting male phenotype in both size and plumage on the right and female traits on the left was spotted and measured. There was a reported sighting of a gynandromorphic Rosebreasted Grosbeak in breeding plumage (on the half, at least) in Presqu’ile Provincial Park, Ontario, Canada in 2007, but I was not able to find the photographic evidence. A gynandromorphic Double-Collared Seedeater, (Sporophila caerulescens) was observedB.G. Tosa, 2004 in Serra Negra, São Paulo, Brazil. Despite having a double collar only on the right side, he sang in courtship ritual and was reported to be hostile with the male suitors of his left side. Gynandromorphic Double Collared Seedeater in Serra Negra, São Paulo, Brazil © Revista Brasil Ornitológico/Criadouro Kakapo Inc.
A not so neatly bilateral gynandromorph of a White-ruffed Manakin (Corapipo altera) was collected in Santa Fé, Panamá in 2004. This was the first caseDaCosta et al., 2007 of gynandromorphy reported for a suboscine passerine, as well as in Pipridae, though the authors conceded that distinguishing the gynandromorph from the immature male in the field is difficult. Remarkably, in this case, while the ovary and oviduct were found on the left and the testis was found on the right side, the bilateral plumage features were reversed relative to anatomical features. This is not meant to be a comprehensive list rather at least a collection of those cases for which photographic evidence could be found, so please do alert me of any gynandromorphic passerines that I have missed (and I am especially missing Old World examples). Furthermore, I should mention that we might be missing a lot. During a routine skin preparation of a road-killed Eurasian Tree Sparrow (Passer montanus), it was discoveredH.D. Bohlen, 2006 that the deceased had a testis on the right and an ovary on the left; therefore, in sexually monomorphic species, the gynandromorphs are cryptic, to us at least. ~ by finchwench on Saturday, 4 June 2011. That’s a fascinating collection, glad you are collecting these cases! I never heard of this before until recently a birder here in Kuwait mentioned one. Thanks for checking out the post! I have some material for a non-Passerine edition . . . on the list of things to do. Right now mine screams: clean the dang house.